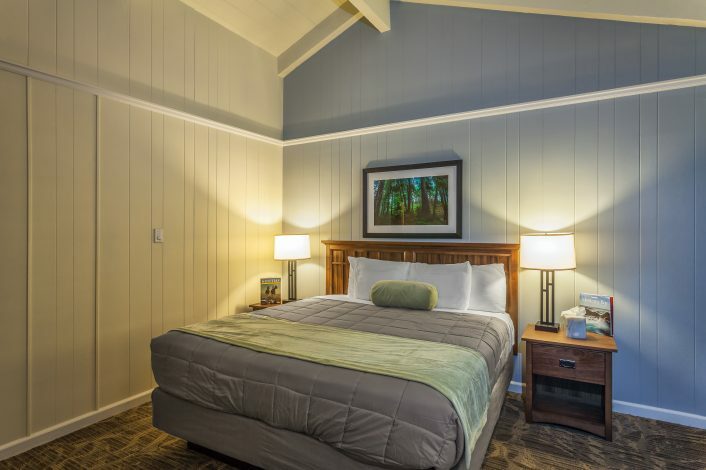 Our charming 62 non-smoking cottage-style guest accommodations offer a wide array of options, including family-style rooms that can sleep up to four, and cottages with kitchenettes and/or fireplaces. Each cottage features an outdoor deck where you can take in the peaceful splendor of the redwood forest around you. Don’t forget to enjoy a rejuvenating swim in our on-site pool that’s surrounded by the mighty redwoods. Family Cottages feature 2 twin beds in a private bedroom, a king bed plus large queen sofa in the living area, and can accommodate up to 4 adults. Each cottage is equipped with a table and chairs, a coffee maker with all the condiments, and a furnished deck looking out into the redwood forest or toward the mountaintops. Our king rooms feature 1 luxurious king bed, a comfy sofa, and are located in a quieter section of the accommodations. All rooms feature a table with chairs and a coffee maker with all the condiments. 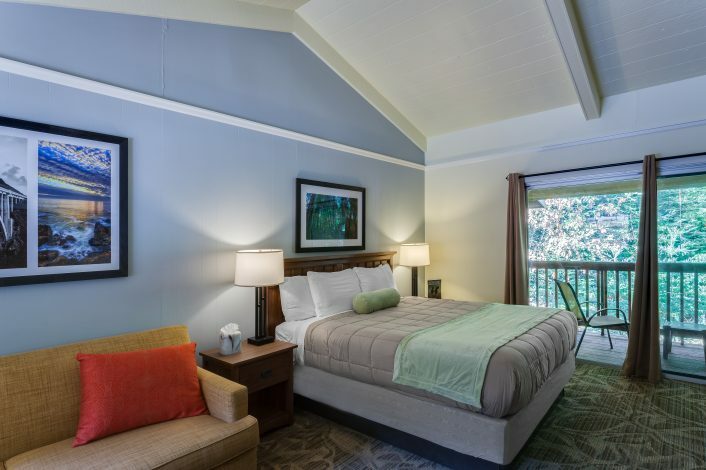 Each room has either a front or back deck with mountain or forest views. 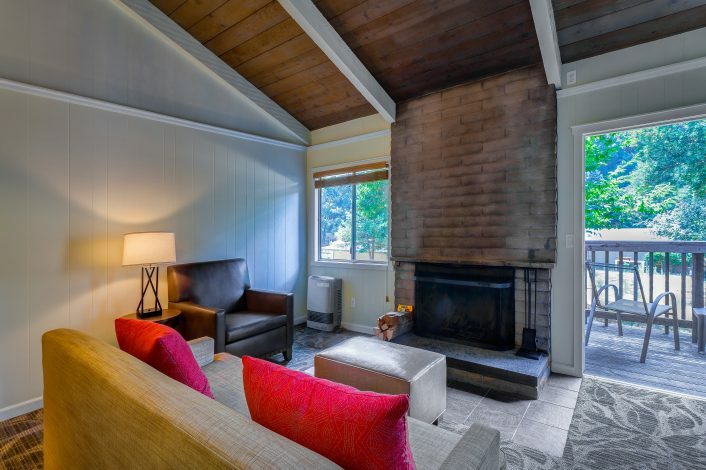 Relax and enjoy your getaway with a wood-burning Fireplace room that can accommodate up to 4 adults. Each fireplace room features one queen bed in a private bedroom, and a queen bed and a comfy sofa in the living area. Each cottage has a table with two chairs, a coffee maker with condiments, and furnished outdoor deck. 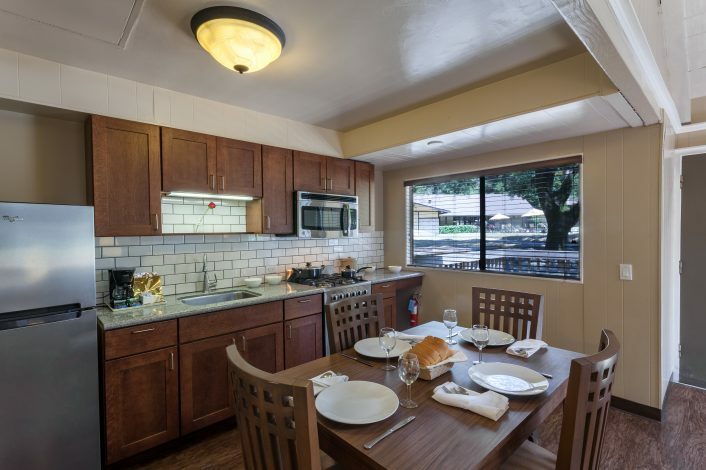 Convenience is key with our kitchenette rooms featuring fully-equipped kitchens and dining area. One luxurious queen bed furnishes the private bedrooms, and the living room features a large comfy sofa. Begin each day with a cup of coffee on your furnished deck overlooking the beautiful park. 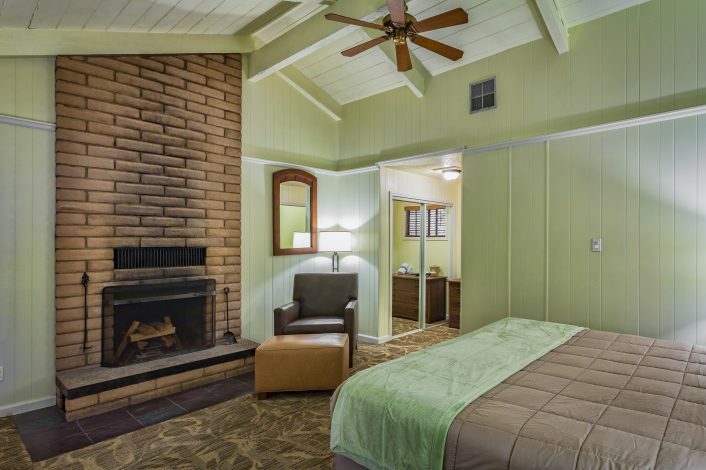 With the convenience of a fully-equipped kitchen and the comfort of a wood-burning fireplace, our fireplace/kitchenette rooms make for a perfect vacation. Your private bedroom features a luxurious queen bed and there is plenty of room to spread out in the living area with a comfy sofa. Welcome each day with a cup of coffee on your furnished deck.